Fitzpatrick’s Future; Gase Sounds Like Everything Chip Kelly Wasn’t; Giants Should Keep Coughlin; Belichick Shoulda Gone for Two! 1a. I think, regardless of what happens Sunday in Orchard Park, Mike Maccagnan has his work cut out for him this winter. Specifically: What to do with free agent Ryan Fitzpatrick? It’s quite the coincidence that Fitz has a chance to clinch his first playoff berth at Ralph Wilson Stadium. The Bills thought he’d be in this position four years ago. In October 2011, Buffalo signed Fitzpatrick to a six-year, $59 million extension ($24 million guaranteed). Fitzmagic was in full bloom at the time; with Fitz working under head coach Chan Gailey, the Bills were 4-2, one game back of the Patriots in the AFC East (with a win over New England), and scoring an AFC-best 31.3 points per game. Now you know the rest of the story. Buffalo lost eight of their last nine that year and went 6-10 the next year. Fitz and Gailey were sent packing. The two were reunited in Floral Park this summer, and are now so close to a Wild-Card matchup with AJ McCarron’s Bengals they can taste it (metaphorically, not literally, that would be gross). Because he’s... well, a white guy, a long-time backup and from an Ivy League school, the perception of Fitzpatrick is that he’s a “game manager.” But the beauty of Fitzpatrick is that he’s a playmaker. He buys time and makes out-of-structure plays. And despite middling arm strength, he makes gutsy throws and gives his receivers a chance to make plays. This year, those throws are “gutsy.” But there’s a razor-thin line between “gutsy” and “stupid.” Fitzpatrick has been on both sides of that line over the course of his career. So what kind of commitment do the Jets make? 1b. A quick note on Brandon Marshall, whose acquisition is being hailed as the steal of the year. And there’s no denying, Marshall for a swap of late-round picks looks like a brilliant move at the moment. But keep in mind, there were mitigating circumstances on this one. Marshall had reportedly rubbed the majority of the Bears locker room the wrong way (similar to what happened in Denver and Miami). When guys are at the root of drama in the locker room, they get moved. For cheap. And the fact that the Bears were reportedly shopping him for a mid-round pick last offseason, and eventually settled for a late-round swap, suggests that the majority of the league agreed with the Bears’ assessment. I don’t know Marshall; from afar, I think his work advocating for mental health is admirable, and he seems genuine in wanting to become a better person. But Marshall, like so many talented players before him, was in the bargain bin for a reason. For the Jets, this seemed less like brilliant strategy and more like a dice roll that went right. 2. If Doug Martin overtakes Adrian Peterson for the rushing title, it would make two straight years that the rushing champion was available on the free-agent market. Hey, you know who I think could use an upgrade at running back? The Eagles. a. As I read Jenny Vrentas’s excellent piece on Chicago Bears offensive coordinator (and soon to be head coach somewhere) Adam Gase, I couldn’t help but think of Chip Kelly and why he failed in Philadelphia. As many have said over the last couple days in regards to Kelly: The NFL is a people business. Kelly, at least in reports, was painted as a sharp mind but inflexible to a fault, unwilling to adjust to the wants and needs of his millionaire employees. Gase (and you should read the whole piece) is also brilliant. And his success has come as something of a chameleon, a guy who is not only willing to take input from players but also willing to delve into their pasts and custom-fit an offense to them. If I were an Eagles fan or player, I’d hope Gase is near the top of Philly’s list of candidates. b. I know Chuck Pagano is a defensive coach who never got enough out of his defense in Indy. But I also think he got a raw deal. Aside from some good talent in the secondary, there was just never a whole lot of explosive talent on the defensive side of the ball to work with, especially after Robert Mathis’s ruptured achilles. c. Similarly, I hope the Giants hang onto Tom Coughlin. The roster just isn’t good enough. On offense, they are devoid of weapons outside of Odell Beckham. On defense, their one game-changer blew his hand off during the offseason. Up the middle they are terrible, once again (foolishly) relying on Jon Beason to stay healthy and trotting out a couple of safeties who just don’t cut it. Talent-wise they were a six- or seven-win roster. If not for some late-game mismanagement, they might have won nine or 10. And late-game management, while frustrating, is correctable. d. One more thing on the Colts: In my very unprofessional opinion, if Pagano is indeed out they should check in with Steelers offensive coordinator Todd Haley. He’s done as well as possible as far as keeping Ben Roethlisberger relatively healthy, designing an offense that gets the ball out of Ben’s hands and minimizing the hits the star quarterback takes. Andrew Luck holds on to the ball for far too long. Finding a way to keep Luck on the field has to be Indy’s No. 1 priority going forward. Haley face-planted as a head coach in Kansas City, but he won an AFC West title with a truly bad roster (with an assist from a truly bad schedule), and I’m not sure there’s a coach who could have done better with the hand Haley was dealt in K.C. e. One last coaching note, but not on the carousel: Steelers fans, I’ve thoroughly enjoyed the conspiracy theories concerning Belichick throwing the Jets game in order to keep Pittsburgh out of the playoffs. I wouldn’t put anything past Belichick, and certainly, looking at the AFC playoff picture I understand the proposed motive. I watched Patriots-Jets in its entirety. You’re about to read a shocking sentence: My football acumen is not on the same level as Belichick’s. So take it with a grain of salt when I say: I felt like, in the Patriots, I was watching a team playing their third preseason game. Like they were treating it as a tune-up for the playoffs (see: giving up at the end of the first half; they had 1:53 and two timeouts!). I think, with all those injuries on offense, that’s as good a reason as any to let your defense take the field at the start of overtime. But, if I could don my tinfoil hat for a moment: If the Patriots preferred to both (a) Win the game, and (b) Limit potential injuries to their offense, why didn’t they just go for two after their last touchdown? They’ve converted 54.9% of third- and fourth downs of four yards or less this year. And simply looking at their personnel, you’d figure they have a better chance than the typical 50/50 odds of success on a two-point try. Even if they weren’t worried about injuries, going for two would seem to give them better odds for a win than kicking off to start overtime. Maybe you’re on to something, Western Pennsylvania. Or, just maybe, Belichick is just wrong every once in a while. 4. I think it’s a good time for everyone to take a deep breath on the Peyton Manning/Al Jazeera/HGH front. Right now everyone involved seems a tad disingenuous. The Guyer Institute doesn’t seem to have an answer as to why one of their employees told Al Jazeera that Charles Sly was employed there in 2011, not 2013. Al Jazeera, for their part, is claiming that they didn’t actually accuse Peyton Manning of HGH use (but, jeez, they walked right up to that line and then dangled a foot over onto the other side). For his part, Sly tried to explain why he shared the (since recanted) information with an undercover reporter, and it sounded… well, kind of like a man trying to explain the plot of Memento. Manning is the only one with a reasonable excuse: If it’s true that his wife received HGH as part of a medical treatment, well, he doesn’t have to disclose that information. So that’s where we sit at the moment. But it’s not where the story dies. Everyone is sniffing around this, and if there are dots to be connected you can be sure that someone at a higher pay grade than Sly knows about it. 5. One last thing on Manning. The tweets we’ve received from a very vocal minority on media treatment of Brady during Deflategate vs. media treatment of Manning over the past week: Early Deflategate reports were based on NFL officials at the AFC title game. Early Manning reports are based on hidden-camera video of an ex-intern (because if I were shipping PEDs to one of the world’s highest profile athletes, I’d definitely make sure my intern was in the fold), since recanted. If you don’t see the difference, you are deliberately being obtuse. I don’t speak for our entire staff, but had Sly made those remarks to The MMQB I would have treated it as a tip and had my reporter do a lot more digging before unleashing it. The short answer is: Yes, of course I would let my kids play soccer. I wrote last week (in a segment unofficially titled “Parenting Advice from an Inadequate Dad”) that my kids will not play tackle football any earlier than junior year of high school. Until then, flag football, soccer and wrestling. Soccer has gotten some heat as the second-leading cause of head injuries among high school girls sports. The concussion rate in boys high school soccer (and I was concussed twice over three years of varsity soccer) is less than half of what it is in football. When it comes to my kids, I’m especially concerned with the dangers of concussions at the youth level of sports, a critical time for brain development. In football, there’s no denying that heads are going to slam into things, especially with the lack of coordination and body control in young athletes. Logically, there are going to be far fewer concussions in youth soccer. The game just isn’t played in the air very often, for a few reasons. First, it’s much harder for young players to get any force or accuracy behind a header. Second, it’s even harder to serve a ball properly for a worthwhile header. And third (and this is more of an observation from decades of playing, coaching and officiating youth soccer), kids don’t want to head the ball, because it hurts. It’s difficult to judge a ball in the air, and it especially hurts if you say, misjudge a keeper’s punt and wind up taking one in the face. A lot of folks are upset with the NFL over the handling of brain trauma a generation ago, but make no mistake: Football isn’t going anywhere. Even if kids move away from tackle football, they’ll play flag and touch. They’ll play Madden and they’ll play fantasy football. And they’ll continue to watch the NFL and college football, because it’s the greatest spectator sport on earth. a. Dan Wetzel with the best takedown of the CFP/NYE stupidity. This is cronyism at its worst. Bad for the schools, bad for the players, bad for the networks, just rich old men greasing palms. Can someone find an example of a woman (not even plural!) who was not interested in watching college football playoffs on a day off, but would pass up New Year’s Eve plans to watch them? That is some Rutgers Is New York City’s Team level bullcrap. c. Actual football stuff: The Clemson fake punt might be my favorite playcall of all time, considering the ACC title game back story for punter Andy Teasdall. d. Sterling Shepard is going to make some NFL quarterback very happy. Sharp routes, and love those hands catches. e. Big Ten needs Jim Harbaugh to stay at Michigan for a long time (and, make no mistake, the NFL will come calling every winter). He’s building a juggernaut there. Sorry to say it, because Mark Dantonio has built a great program at East Lansing, but right now Ohio State is the only program in that conference that gets the athletes capable of playing with a team like Alabama. 8. I think, while you’re counting down the hours to kickoff, you should spend some time with The MMQB Reads of the Week: It’s a double dose of Robert Klemko. Usually, when a writer has to work a couple of stories during a holiday week, you give him or her a “thanks for the effort” as you work up a decidedly mediocre piece. Klemko put together two monster stories for The MMQB in the past week, one football-heavy, and one for the sentimental crowd. 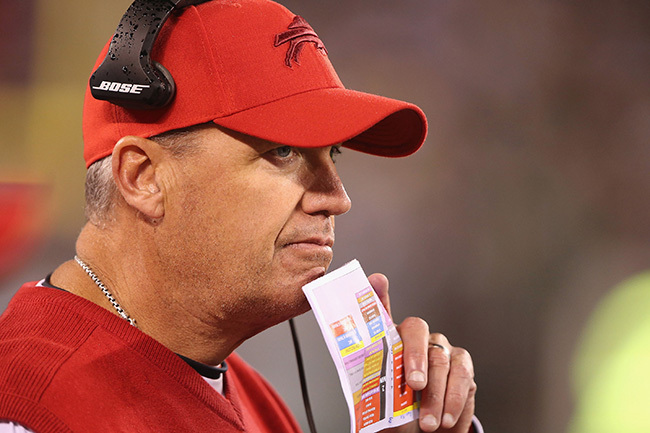 First, there’s “The Hiring List,” running down the top candidates for head-coaching jobs. This isn’t some hacky, thrown-together blogger list. Robert talks to, in scientific terms, a buttload of people around the league to compile it. It’s legit. And second, there’s the road trip from St. Louis to San Diego to Oakland, emotional stories of what might be the final games for each of those cities. Rex Ryan has gotten the best of Jets offensive coordinator Chan Gailey in the past. a. When Rex Ryan coached the Jets and Chan Gailey coached the Bills, Rex won five of six. He also got the better of Gailey when these teams met in East Rutherford back in Week 10 (though that was a Thursday night game, and Thursday night games are typically garbage). b. It’s actually been three years and one month since the Patriots won in Miami. I don’t expect Dan Campbell to keep his job. But at some point, Ryan Tannehill has to do something before garbage time if he’s going to deserve the confidence of the next coaching staff. c. Drew Brees is phenomenal. Since Nov. 1 he is averaging 334.5 yards per game and had thrown 23 TD passes over eight games. Instead of sitting out with a plantar fascia tear in his right foot last week, he went out and torched the Jaguars for 412 yards and a 135.4 rating. On Sunday he goes against the Falcons, against whom he’s thrown for more passing yards (6,098 in 20 games) than any opponent in his career. There’s a lot of talk about what’s to be done with his contract, in light of next year’s $30 million cap hit. But considering how well he’s playing, and considering the Saints’ atrocious cap management, that might be one of their more reasonable deals. d. Take Brandon Browner, one of the most confusing signings of last offseason, for instance. They will take a $6.3 million cap hit on one of the worst cornerbacks in football next year if he’s still on the roster. The Times-Picayune has a fun (or, if you're a Saints fan, horrifying) little interactive chart about the cap ramifications of cutting Browner. e. So many Flacco vs. Dalton classics. Of their nine matchups, seven were decided by one possession. On Sunday it’s Mallett vs. McCarron. The last time the Bengals faced Baltimore without Dalton under center they started Carson Palmer. The last time the Ravens went to Cincinnati without Joe Flacco, Steve McNair was under center. f. Pittsburgh’s crippling loss at Baltimore was the stunner of the 2015 season. You’d like to think that they can go to Cleveland, beat the Austin Davis-led Browns and pray. But they’ve actually lost two of three at Cleveland, including a 31-10 shellacking last season. g. So here we are, Houston Texans. Six different players have thrown a pass for Bill O’Brien this year, and perhaps more impressively, 12 different players have had at least one rushing attempt. They can lose at home Jacksonville and are still highly likely to make the playoffs. Only in the AFC South. h. The Titans, who haven’t been competitive in any of the last three weeks, visit the Colts, who have all-but-officially found a way to give away football’s worst division. I can’t think of a worse way to kick off 2016.
i. This seems like the kind of game the Cowboys will be desperate to win. It’s completely meaningless to Washington. But a Dallas victory will assure a season sweep of the division champion, which seems like the kind of thing Jerry would enjoy bragging about over the next nine months. j. I hope the Giants show up for Tom Coughlin today against the Eagles, if not to save his job then to at least give the coach a respectful send-off. k. If the Lions are going to move on from Jim Caldwell, they should keep an eye on the opposite sideline on Sunday: Adam Gase. l. The Panthers have suddenly been outscored 41-16 over their last five quarters of football, including a humiliating loss to Atlanta last week. They better have their guard up against an upstart Bucs team on Sunday; Tampa has three road wins this year. m. Man, it’s good to be the Chiefs right now. Playoff berth locked up, AFC West crown unlikely but within reach, and Justin Houston back in the lineup. On the other side of the ball in K.C., it would be nice to see the Raiders do something good to wrap up the season. Not just to get to eight wins for the first time since 2011, but to put some confidence back in a young offense that has not looked sharp the past three weeks. n. You know the Chargers would love to spoil the Broncos’ division title hopes, and unlike last week Denver is facing a team with a significant advantage in the quarterback department. o. I’d love to see how the new-look Seahawks offense matches up with a… different Cardinals D. Arizona isn’t the same on the back end with Tyrann Mathieu gone. But their pass rush was unbelievable the last two weeks, Dwight Freeney’s fresh legs coming up huge, Calais Campbell finding his form, and Markus Golden becoming a force. The Seahawks’ front five couldn’t handle the Rams. Will it be any different against the Cardinals pass rush? p. I’m not one for throwing games late in the year. But dang, St. Louis Rams, three straight meaningless wins has taken you out of contention for the top quarterbacks in the draft. And it’s likely a fourth straight win with Sunday’s visit to San Francisco. q. First it was the receivers, now it’s the offensive line. Aaron Rodgers has said the Packers will pull it together when it counts, and the Sunday night game counts. The one outlier in the Packers’ miserable second half was the 30-13 win at Minnesota. I’m not so sure they can do it again at Lambeau.